Overuse of muscles typically leads to pain. I am a Board-certified orofacial pain specialist. It is a unique specialty of dentistry, which I learned during a two-year residency at the UCLA School of Dentistry Orofacial Pain and Dental Sleep Medicine program. I am now a clinic-co-Director of the UCLA residency one day a week and I have a private practice in Beverly Hills, CA the other four days of the week. 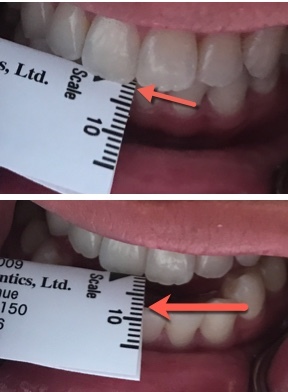 I have been treating patients who complain of “TMJ” for the past 7 years and I never need to touch teeth since my training proved to me that the pain patients complain about are not related to occlusion, which is how teeth meet. If it is not related to the bite, what is it related to? I would say the 98% of the patients who think they have pain related to their TMJ, are actually suffering mainly from muscle pain. The pain is mainly due to overuse of the muscles from daytime clenching and/or bad oral habits during the day such as chewing gum, nail biting, and nighttime habits such as clenching and/or grinding during sleep. Any muscle that gets over used needs a break. If the muscles do not get a rest, they will start causing pain. There are four muscles that close the jaw. These muscles are the superficial masseter, deep masseter, temporalis, and medial pterygoid. The superficial masseter, when measured on a pounds per square inch basis, is the strongest muscle in the human body. 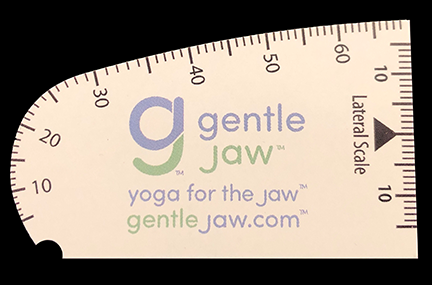 When patients come into my office I always have them point with one finger where their main pain is and they almost always point to the angle of the jaw, which is the superficial masseter. When your teeth are touching, the closing muscles of the jaw are contracted. As humans, we do not walk around with our teeth together. If you find yourself clenching your teeth during the day, you need to stop. 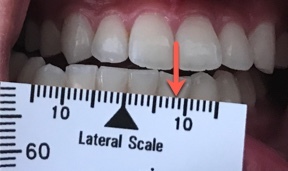 Your teeth should be apart during the day in the “N-Rest” position, which you can learn about at this page on my website. The graphic below is from a slide I give to dentists and other specialists that want to learn what I do. You don’t have to just take my word for it. My training is evidence-based. A fantastic paper by Dr. James Fricton showed that a placebo equilibration is slightly better than an occlusal equilibration. What does this mean? An occlusal equilibration is an irreversible surgical procedure where a dentist grinds a small amount of enamel off your teeth or material off your crowns, fillings, etc. to get your teeth to meet more evenly. However, Dr. Fricton’s paper showed the when you do a placebo equilibration that patients report more improvement. A placebo equilibration is when the patient thinks their bite was adjusted when in reality nothing was done. This is accomplished by “adjusting” the teeth with the smooth end of a dental bur. The patient thinks something was done since they felt the vibration of the drill on their teeth but in reality, nothing was adjusted. The bottom line is this. It is incumbent upon all health care providers to try all non-surgical and reversible procedures first before doing surgery. Cutting healthy teeth or existing crowns or fillings is surgery and it is not reversible. If you suffer from what you think is TMJ, try softening your diet, keep your teeth apart during the day, stretch your jaw muscles several times a day, and during sleep wear a hard, full coverage night guard preferably over your lower teeth. I never have patients wear an appliance 24 hours a day, I never have patients wear an appliance during the day, and I never have patients wear an appliance for “TMJ” that is designed to change their bite. If your dentist ever uses the terms “Phase 1 and phase 2,” I would highly encourage you to get a second opinion from a Board Certified specialist in orofacial pain. Here is a link to the American Board of Orofacial Pain member directory. I would be happy to see you at my office in Beverly Hills if you are in the Los Angeles area. Remember, it is not about the bite. It is about keeping your teeth apart. Trigeminal neuralgia is considered one of the most painful conditions known to mankind. It is a sharp, shooting, electrical pain, which can mimic a toothache. This is because the trigeminal nerve innervates all of the teeth and their supporting structures such as the gum and the bone. The pain is generated from the brain but because of the way the nerve pathways work, patients will swear that the pain is from their tooth or from even multiple teeth. However, the pain will persist no matter what you do to treat the tooth including a crown, a root canal or even an extraction. Yes, even if a tooth is removed, the pain caused by trigeminal neuralgia will remain. 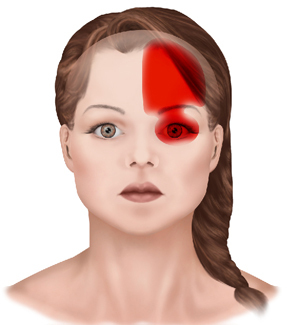 The diagnosis of trigeminal neuralgia can sometimes be very simple. A well-trained clinician should never touch a tooth without having clear clinical and/or radiographic (x-ray) evidence of pathology such as decay, a tooth that is cracked, or symptoms based on hot and cold sensitivity and biting pressure. Additionally, tooth pain can throb and remain painful for hours and days. Trigeminal neuralgia only lasts a few seconds or minutes but the pain completely goes away, and it typically but not always does not bother patients during sleep. Some patients have what we call a “trigger zone,” which is an area that can be pressed firmly or touched lightly with a Q-tip to trigger the pain. If a trigger zone is found, then the next step is to try to block the pain. The first step is to try to block trigeminal neuralgia with topical anesthetic placed directly on the trigger zone with a Q-tip. After waiting several minutes, the Q-tip test with pressure and light touch is repeated to see if the pain can be replicated. If it cannot, then it is likely trigeminal neuralgia since most dental pain cannot be blocked with topical anesthetic. If the pain cannot be blocked with topical, then the local tissue is numbed, and if that does not block the pain, then the tooth is numbed. If the pain is not blocked with any of these anesthetics, then the pain is likely centralized, and trigeminal neuralgia is likely ruled out. If the pain can be blocked, then it is likely trigeminal neuralgia but the patient will need an MRI to rule out space containing lesions such as a brain tumor, acoustic neuroma, multiple sclerosis, etc. The most important word to remember is “electrical.” If a patient ever describes electrical pain that completely resolves after a few seconds or a few minutes, then the pain is very likely due to trigeminal neuralgia. High-resolution MRI with and without contrast of the brain and brain stem with thin cuts through the posterior cranial fossa with attention to the trigeminal nerve using Fiesta images with vascular loop protocol. Rule out space containing lesions, multiple sclerosis, acoustic neuroma, trigeminal neuralgia, etc. Please rule out contact of superior cerebellar and anterior inferior cerebellar arteries with the trigeminal nerve. This image shows the MRI of a patient I was treating was normal. However, the radiologist did not address if one of the two arteries were in contact with the trigeminal nerve so a follow-up contact with the radiologist asked him to rule out that the arteries were not touching the trigeminal nerve. As you can read, the right superior cerebellar artery was likely in contact with the trigeminal nerve, which can account for the patient’s pain. After an MRI is obtained and is clear for space containing lesions, the patient has a couple of options depending on the results of the MRI. If the superior cerebellar artery or the anterior inferior cerebellar artery are in contact with the trigeminal nerve, the patient is treated using anti-seizure medications and/or they can consult with a neurosurgeon to learn about surgical options such as a microvascular decompression (MVD). If either of these arteries is not touching the nerve, then a neurosurgeon is not as likely to be successful with an MVD procedure. Typical anti-seizure medications include gabapentin, oxcarbazepine, carbamazepine, Lyrica, Keppra, Lamictal, etc. If you have any questions about trigeminal neuralgia if you are a doctor or if you are a patient, or if you are interested in having me lecture to your group of any size, please feel free to contact me at my Beverly Hills office, which is 310.359.9080. This blog post is about my last road bike ride. Yes, my last ride. The post was inspired by a fellow cyclist who approached me after a very fast road bike ride with a group of about 50-60 cyclists. It was the weekly NOW ride, which stands for “No Opportunity Wasted” The ride is on Saturday’s and it leaves from a local coffee shop in Santa Monica, California, and it rolls out to Trancas in Malibu on Pacific Coast Highway, which the locals call PCH. The ride is very fast, and you need to keep pace by staying within a few inches of the rider in front of you or you lose the draft effect. If you don’t keep pace you sometimes get called out by other riders for not holding the wheel of the rider in front of you. It is a ride for experienced cyclists only, due to the speed and intensity. About halfway to Trancas is Pepperdine Hill, which is a hill that tends to split the group since not everyone is a strong climber. I was riding very strong today, and was able to stay with the lead group. I was helped by a traffic light at the top of the hill, and caught up with the very fast riders at the light. I was then able to ride with the main group over the undulating road along the Southern California coast all the way to the gas station at Trancas, which is about 20 miles from the start. We rest, hydrate, and refuel at the gas station for about 15 minutes before heading back along the coast to Santa Monica. The initial pace on the return to Santa Monica was very reasonable until we reached PCH after leaving the Malibu Colony, and then pace was increased again. 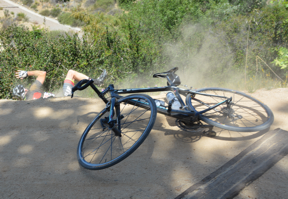 And, again, I was able to ride with the lead group all the way to the parking lot at Temescal Canyon in Santa Monica. The fast part of the ride was done, and then we crossed under PCH via a tunnel, and climbed a short hill to get up to Ocean Avenue, which overlooks the Pacific Ocean in Santa Monica. This is my double spinal fusion. The left side shows the herniation of L4-L5, and the collapse of L5-S1. The middle and right images are the spinal fusion screws. A Camelbak is safer than a water bottle. I don’t have to reach down and take a bottle out of a holder at 30 miles per hour, take a sip and then reach down and replace the bottle into its cage. A water bottle occasionally comes out of its cage and falls into the roadway, which is then a dangerous hazard that can cause a whole group of cyclists to crash and injure themselves. I drink more with a Camelbak than my friends who use water bottles since it is more convenient to sip from a hose, which is a few inches from my face, than to reach down and grab a bottle. And, for me, a Camelbak is painless whereas a water bottle causes pain. I like pain but only pain from the soreness that comes from a good workout. The Judge’s attitude offended me for several reasons. The Judge did not accept the fact that I was different than him. The Judge did not accept the fact that I did not conform to the norm. The Judge was judging me based on my appearance, and not my performance. When you really think about it, it is a form of discrimination, and I was offended. Several other people heard the exchange and told me to “consider the source” but I want to try to turn this into a life lesson. A teaching moment. What is it about some people that they cannot accept others who are different than the norm? What is it about some people who judge people based on how they look, how they dress, who they love, who they identify with? Who are they to be judge and jury to say what is socially acceptable? Would the Judge reject his child if his child was gay, lesbian, transgender, bisexual, asexual, etc? My guess is yes since that is not the norm. If someone like the Judge can’t understand why I have to be different, why I don’t use what the pros use, why I have to accommodate to my personal situation even after hearing a very valid and reasonable explanation, then the Judge and people who think like him need psychological help since it is they who are the source of any problem instead of the person who is different. Be different. Be yourself. Do what makes you happy. Be your own person. Don’t let people like the Judge change who you are. And, yes, I’m still going to ride my road bike. My next road ride is tomorrow. This blog post simply refers to my “last ride” as in my “most recent” ride. It’s all about semantics. See you on the road. *And don’t let a dentist ever grind or adjust your teeth, or have you wear a dental appliance 24 hours a day for several months since it is not part of any accepted treatment protocol for chronic head and neck pain. This has nothing to do with this post but it is good to remember since many dentists think otherwise. See an orofacial pain specialist by finding one at www.AAOP.org. What does that have to do with facial pain? Everything. Most people who own an iPhone are not going to deliberately try to bend their phone just like most people will not try to deliberately overwork their facial muscles. My point is that everything has a tipping point, which is a point at which something will break, or in the case of facial muscles, a point that will cause pain. The superficial masseter is the strongest muscle in our body in pounds per square inch. The superficial masseter, which is a very strong muscle, and is one of four closing muscles, is a muscle that does a lot of work during the day due to chewing, talking, and swallowing, and, it is working extra if you clench your teeth during the day, bite your nails, chew gum, etc. At night, it really goes to work since most people clench and/or grind their teeth at night. We really do not know why people clench and/or grind their teeth. There are a lot of theories but there is no definitive answer, and there is no medication that we can give to a patient to get them to stop the habit. There are medications that can increase clenching and/or grinding such as SSRI’s, which stands for selective serotonin reuptake inhibitors. These are anti-depressant medications, and the common brand names are Prozac, Celexa, Zoloft,Paxil, and Lexapro. If you start to feel pain in your jaw or in your temples, you are likely overworking your closing muscles, and they need a break. Stretching is something that I have almost every patient in my Beverly Hills facial pain and migraine headahce practice do, and my favorite way to have them stretch is to use a wine cork. It must be measured to the appropriate length so don’t just try sticking a cork in your mouth and expect to get better. I do not recommend that you try to bend your new, or old, iPhone to see if you can bend it because there will be a point at which it will bend. For the same reason, I do not recommend that you clench your teeth during the day and chew gum for three to four hours a day for months on end since you will likely end up with facial pain and/or headaches. If you do have facial pain, please feel free to give me a call at 888.981.8981. In the meantime, I guarantee you that you can bend a paper clip if you try but if you use it for its intended purpose, it will be useful as a paper clip for many years. Treat your mobile phone, and your facial muscles the same way. “Yes, I agree with you. You are taking that medication for your headache. In other words, the medication you are taking is what is causing your headache.” I have have that conversation with many patients in my Beverly Hills facial pain practice for people who suffer from migraines, tension-type headaches, cluster headaches and many other headaches. A medication is not always safe to take just because it is over-the-counter or because your doctor prescribed it for you. We name these headaches “medication overuse headaches” or MOH for short. MOH’s are also called rebound headaches because as your body eliminates the medication you have been taking, it starts to crave the medication, you get another headache so you take more of the medication, which helps the headache until your body starts eliminating the medication again, and you are stuck on a vicious cycle. Medication that are combinations of different drugs are the usual culprits. These include Excedrin for Migraine, Excedrin Extra Strength , Fiorinal, Fioricet, and medications with Soma. As a matter of fact, Excedrin for Migraine and Excedrin Extra Strength are the exact same medication even though Excedrin for Migraine usually costs more as you can see below. Fiorinal and Fioricet both contain butalbital, which is a barbiturate, and caffeine plus an analgesic. The difference between these two medications is that Fiorinal contains aspirin, and Fioricet contains acetaminophen, which is known as Tylenol. As a point of trivia, the Rolling Stones wrote a song named, “Mother’s Little Helper,” which is about Soma. It does help but it is short lasting, so you take another pill, which then wears off. This cycle continues until you need to take yet another one for the headache that will be caused by your body wanting more of the medication. Many other drugs taken in excess can cause a medication overuse headache. Triptans, such as Imitrex, Maxalt, and Replax, which are designer drugs specially targeted to abort migraines, should not be taken more than nine times a month. If you are taking more than that, part of your headache could be due to medication overuse headache. If you have a headache for more than 15 days in a month, if you overuse medications on a regular basis for more than 3 months, and if your headache has developed or markedly worsened during that time you have been taking the medication, then your headache could be completely or partly due to medication overuse headache. Marketing, and the color of the box, is the only difference between these two products. 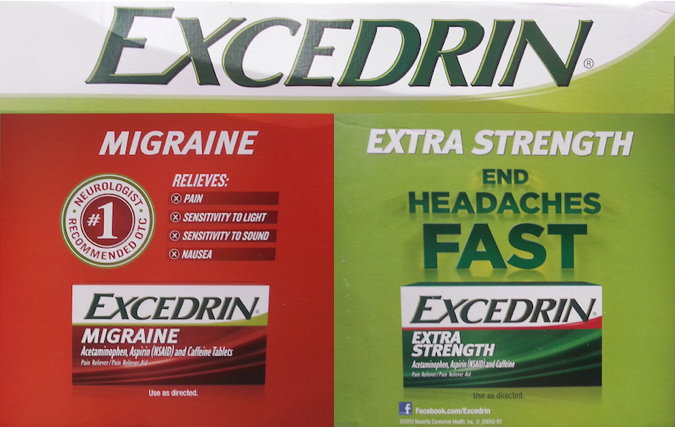 Excedrin for Migraine and Extra Strength Excedrin have the same ingredients milligram for milligram. 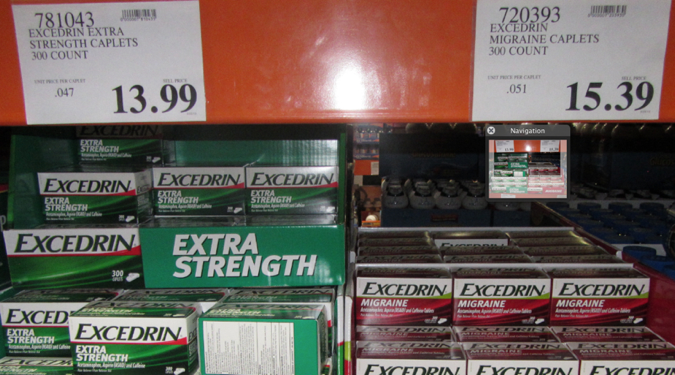 Excedrin for Migraine usually costs more than Excedrin Extra Strength. Why? Maybe because it has the word “migraine” and maybe because red ink costs more. Both boxes contain 300 caplets. The price per caplet for Excedrin Extra Strength is 4.7 cents and the cost per caplet for Excedrin for Migraine is 5.1 cents. That equals a 10% premium for Excedrin for Migraine. We all make mistakes. If you aren’t making mistakes you are probably not trying hard enough. If you make a mistake, and others agree it is a mistake, nothing is more rewarding than making an apology to those impacted by the mistake. However, if your apology is followed by the word “but” and a whole bunch of other words, it disqualifies the apology since you are now making excuses or qualifying the apology, which is never good. The following are three short stories of apologies offered to me this week. As regular readers know, I am a cyclist. Some cyclists ride their bike, and some cyclists race their bike. Personally, I am a rider and I have never competed in a bike race with the exception of the 2000 Malibu Triathlon, which I raced as a three person relay team with two friends from business school who raced the swim and run portions of the triathlon. I don’t race since it is not important for me to compete in sanctioned events to try to win trophies, medals, or money. Racing also adds an element of risk to cycling that I don’t want to take. Road rash from a bike crash. I was involved in my first ever bike crash that involved another cyclist this past Thursday. I was on a regular club ride on the streets that surround the Riviera Country Club. I was with a small group that had made a traffic light, and the large group stayed behind. As a result, I was ahead of most of the stronger riders in the group. Near the top of the climb, the stronger riders came quickly up on my left, which is the proper place to pass. One rider came on my right. He bumped my shoulder since there was a Corvette parked in front of us and he had to make room to pass me. He moved left, and when he did, my front wheel and his back wheel touched, and I went down. As with all crashes, everything moves in slow motion. I hit the pavement, and saw a rider behind me come over the top of me. The rider that caused the crash stopped, and tried to help me up but I needed a minute to collect myself and assess my injuries. My right elbow took the biggest hit followed by my right knee, both of which you can see, as well as my right hip and left hand. Yes, I’m left handed but my cycling glove looks worse than my hand. He then apologized for being too aggressive on a club ride and felt bad that I was injured. If I was a soccer player, I would probably still be laying on the ground slithering in pain. As a cyclist, I got back on my bike and started to ride. My front wheel was out of true but I was able to ride it, and complete the remaining 2.5 laps of the club ride but I was feeling something strange on my inner thigh. When I went down, I must have stretched the right adductor magnus, which is the inner thigh muscle. After stopping for my usual Matcha Green Tea Latte at Peet’s Coffee in Brentwood, I then rode 10 miles to get home, cleaned my wounds, stopped at the drug store to get Tegaderm patches, and then went to my office to see patients. Fortunately, my wife and daughter were out of town since they could not stand to hear the construction noises from our neighbors house, which is described below. My point is that the apology I received was very sincere, and I consider what happened an unintentional accident, and there are no hard feelings. Earlier in the week, I watched a video that was a very public apology by Laura Weintraub, who previously made a video blog about why she hated cyclists, which ended up going viral. Her video was the reason I was interviewed by the local Los Angeles NBC News, and it was part of the subject for a previous blog of why I felt she was so wrong. I did not mention her by name in my previous post since I did not want to give her more attention. So why am I using her name now? Laura made a new video, which you can watch below. I reached out to her on Twitter and Facebook to tell her I appreciated the new video she made, and we are now Facebook friends, and I hope to personally meet her someday. Why would I want to be friends with someone who made a video that put a bounty on drivers hitting cyclists? After watching the video above, and hearing Laura sincerely admit that her video blog about hating cyclists was a mistake, I wanted to commend her for admitting her mistake, and making a public apology. We all make mistakes but Laura’s was very public. My point is that the apology I watched in the video was very sincere, and I consider what happened a mistake, and there are no hard feelings. My neighbor’s driveway under construction…again. Lastly, my neighbor was redoing his driveway for the fourth time. We share the bottom part of the driveway, and his portion is long and steep up to his house. His previous attempts to patch it failed so he was finally doing it the right way, which involved lots of jackhammering, and lots of concrete, and lots of noise. Last Sunday, he had construction workers at his house using concrete saws to cut the driveway but he skipped out of town to miss the noise. I was not home last Sunday but my daughter told the workers it was illegal to work on Sunday’s but the workers continued working anyway. I spoke with the contractor later in the week, and he said that he did not “even know what day it was since he was hospitalized over the weekend due to an infection.” I asked him if he knew it was illegal for contractors to have their workers work on Sunday in the City of Los Angeles, and he said I was wrong. I know the rules since I was President of our homeowners association for 10 years, and would get occasional calls from neighbors complaining of work being done on Sunday’s, which is why my daughter knew the rules. I got my laptop and showed him the LAPD website, which lists the allowable construction hours. After viewing the web page, he apologized but he said he would work again on a Sunday since he had texts and emails from the owner saying the construction needed to be finished ASAP, and that he does not care when he works as long as he gets paid. My point is that the apology I received was followed by a “but,” it was not sincere, and the contractor did not consider his actions a mistake since he would do it again for money. When you make an apology, make it sincere by not adding the word “but” followed by a whole bunch of other words that the person who was wronged might not even hear since you qualified your apology. “I’m sorry” by itself is much more powerful and much more sincere. I know I’m going to make more mistakes in my life, and if I wrong you, I hope you will only hear “I’m sorry” without anything else! That’s my opinion and I welcome any comments. I wrote this for Drew, my daughter, right before we dropped her off to start her freshman year at UCSB. It was shared many times on Facebook so I decided to post it to my blog. Please let me know what you would add to the list. Enjoy! 2. Make decisions based on what you think is the right choice to make. 3. Listen to live music. 4. Take advantage of the rec center, and the beach. 5. Accept that four years is a short amount of time. 6. You are going to have hurdles in college, and in life. Find a way to get over them but don’t be afraid to ask others for help. 7. I guarantee you will find friends for life in the next few years, and even in the next few days. 8. College is much harder than high school. It’s supposed to be. Don’t let that scare you. 10. People rarely change so don’t expect them to. 11. Meet your professors, go to their office hours, and ask them questions. They love to teach and get to know their students. 12. Get involved with something you are passionate about. You will make friends with others that share the same passion. 14. Worry about the things you can control, and don’t try to control the things you can’t. 15. Something I never had to think about was the immediate impact and reach of social media. Have fun but always remember that one photo or video of what you are doing and/or saying can have a long lasting impact on your life, and remember that viral can be as bad as a virus. 16. We live in s small world but the planet is huge. Take advantage of the fact that you will be meeting people from all over the world. 17. Don’t forget to laugh at yourself when you make a mistake but be sure to learn from it. 18. Even though you are an adult most of the boys at college are still boys. Pay attention to how they treat others since they will eventually treat you the same way. 19. Learn to say no and make sure the person hearing you knows that is your answer. 20. Keep watching for shooting stars like you saw on the beach your first night on campus with me. 21. Advice is what others give to you. Seek it out but accept it as advice and know that the decision on what to do is up to you. 22. Everyone around you is feeling the same type of emotions you are feeling so don’t be afraid to talk to your friends about what or how they are feeling. 23. Listen to live music. I know that is a repeat but it is worth the reminder. 24. Don’t be afraid to try something new as long as you are making the choice and it is something you want to do. 25. Don’t pay for an extended warranty…except for Applecare. 26. Don’t let school get in the way of your education. 27. You can’t force someone to repay money you loaned them unless you plan to go to court or to jail so giving people money is rarely a good idea unless you don’t need it back. 28. Bend with your knees not with your back. 29. Measure twice, cut once. 30. Be amazed by our world. You will have a nightly reminder looking at the stars from the beach. 31. Realize that the people you think are “normal” are the ones you don’t know very well. 33. College is your first time living away from home but home is always here. 34. If you love someone, tell them. 35. I love you. I’m proud of you. You are my inspiration and I can’t wait to live vicariously through you for the next four years.